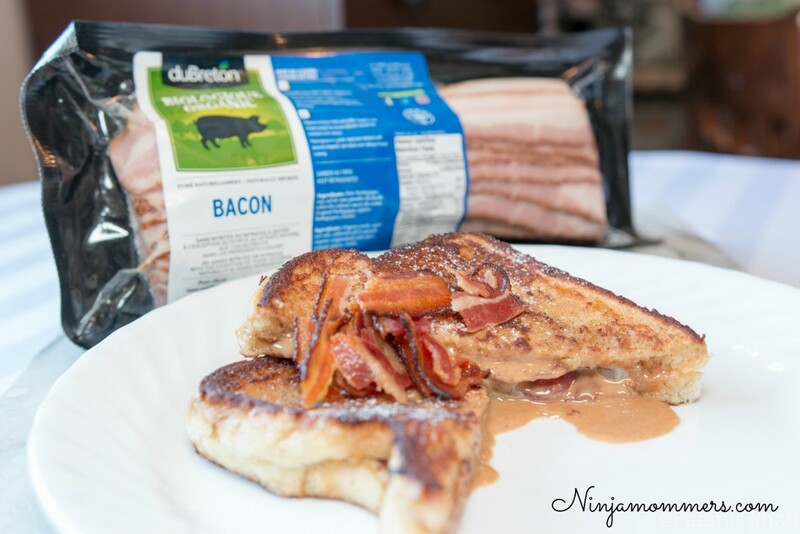 Peanut Butter Bacon Stuffed French Toast? Bacon. Salty, crispy, delicious Bacon. If you were to ask me what my favorite food item is I am pretty sure I’d respond rather quickly with BACON! My family is comprised of Bacon lovers. I feel any recipe can be made much more interesting by just incorporating some delicious Bacon into it. Creamy delicious peanut butter sauce, accompanied by crunchy flavorful bacon sandwiched between two delicious peices of perfectly cooked, mouthwatering french toast. You will never see breakfast the same way again. In a medium sauce pan over low heat, combine peanut butter, sugar and butter until melted. Place in freezer for approximately 20 minutes while you prepare the bacon. While peanut butter mixture is cooling, cook bacon as per package instructions, and set aside. Combine eggs, milk, vanilla and cinnamon in a medium sized bowl and set aside. another slice of bread to form a sandwich. Dip sandwich into egg mixture, lightly coating all over. and gently press down to seal edges. Fry each sandwich, until browned, flipping once to cook each side. Let rest for 5 minutes before slicing in half. The peanut butter filling will melt out the sides while cooking if they are too close to the edge. Garnish with crumbled bacon, sift icing sugar and/or drizzle with maple syrup before serving. One day we were all sitting around the table trying to decide what we were going to eat. My daughter was begging me for some peanut butter toast, my son asked for french toast and my husband, staying true to our bacony nature, requested something with Bacon. I was really trying to keep my head on straight through this whole ordeal but EUREKA! I was all of a sudden completely overwhelmed with an amazing idea.. a delicious idea…. an idea that would change the course of breakfast for the Ninja Mommers family FOREVER. Peanut Butter Bacon Stuffed French Toast. What is this idea you ask? Well I am about to tell you… BUT FIRST. First, you need to hear my Bacon backstory… because well… there is always a bacon backstory. You see, duBreton came into my life not too long ago. Who is duBreton you may ask?! Well, I may as well cut to the chase. duBreton is a Certified Humane all-Canadian family-farming business. All my favourite things in one! They are Canadian, they are family owned and they DO NOT use crates to raise their pigs. Not only does duBreton NOT crate their pigs, but they are also grain fed, raised without antibiotics and so much more. My kind of product… AND it’s BACON. Did you know international Bacon Day is on September 3rd this year?! Make sure to share the Bacon love. 1.Turn the oven on to 400°F (200°C). grease to drip down into the pan. 4.Cook the bacon to your preferred level of doneness (15-22 minutes). We really love using the oven to cook our bacon as we find that it’s so consistently cooked and easily done! Ok Let’s get down to business… I have teased you enough… Without further ado I give you… THE RECIPE. Love that it uses pork smoked bacon. We enjoy bacon and egg muffins homemade! Thanks! I love that it’s stuffed with peanut butter! sounds yummy especially the peanut butter part. Thank you. I eat breakfast everyday and my favourite part is the peanut butter! Pork smoked Bacon is the best part for me. Bacon and peanut butter! I love this combo and have for years! Sounds amazing! My favourite part is the peanut butter. I eat breakfast everyday. I don’t eat breakfast very often and when I do I prefer it to be savoury (I eat french toast plain with salt). I do think my husband and kids would love this unique recipe, even though it’s not for me. It would be terrific to win a #duBretonDelicious Prize Pack. and tell you what my favorite part is and Do i eat breakfast? and i eat breakfast once in awhile. I like that its a stuff sandwich french toast. Never did it like that before. Sounds yummy. My favourite part is the combo of PB-Bacon. And I do eat breakfast! Ohhhh my this looks delicious. I love that it is stuffed. I eat breakfast everyday. I think the bacon is the best part! Oh and I do eat breakfast every day. I would use turkey , chicken or tofu bacon in mine . Great recipe sounds so yummy. if i am hungry I eat breakfast , most times i have brunch . The peanut butter is my favourite part. I do eat breakfast – my favourite meal. Breakfast is the best! Bacon can only make things better and stuffed french toast with Bacon has to be amazing. I love breakfast food but I rarely eat breakfast. It’s not breakfast but guess what we are having for supper!!!! I’m not a huge fan of breakfast but I’m always a sucker for bacon! The combination of salty & sweet in your french toast recipe sounds amazing!! My favourite part of the recipe is the easy peanut butter sauce. I love trying new versions of french toast so this recipe is exciting! We eat breakfast most mornings before we head out for the day. My favourite part of this recipe is the french toast. I like sweet and salty combos so this might be an interesting recipe. I always eat breakfast and look forward to it. My favourite part of the recipe would be the bacon! Bacon makes everything better! I occasionally eat breakfast and when I do it is either a piece of fruit or muffin or yogurt and juice. This recipe sounds so yummy. We usually only enjoy bacon breakfasts on the weekend as we have more time then. I love the combination of peanut butter and bacon. My two favourite flavours are bacon and peanutbutter. so it sounds wonderful. 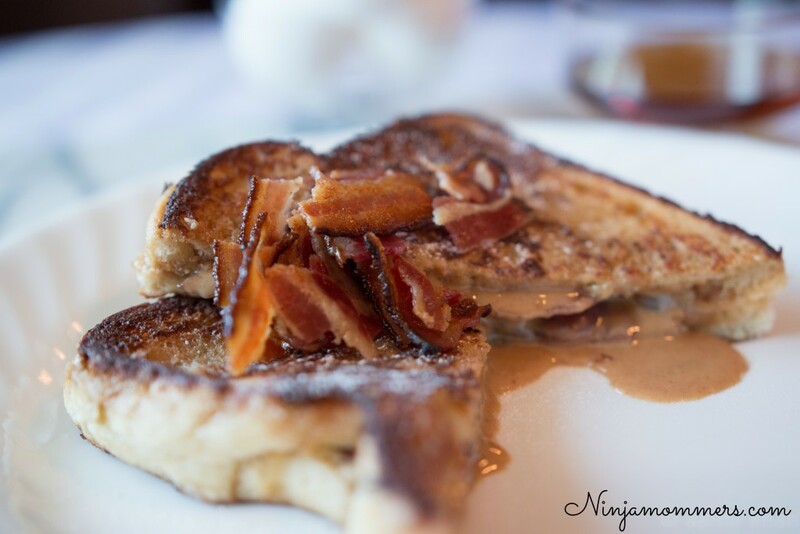 French toast, peanut butter and bacon….what’s not to like! I love the combination of peanut butter and bacon! I always try to eat breakfast in the morning, it’s the most important meal of the day! I love that it’s a flavor combination that is new to me that I’ve never tried! And I love bacon so that’s a win. I don’t always eat breakfast, sometimes it’s just a quick cup of coffee. My favourite part is the bacon. I usually have breakfast. Looks amazing. We love breakfast! My favorite part is the bacon! I enjoy breakfast at home with my kids before school. What a great idea ! I love peanut butter ! 😀 I eat breakfast most days, some days i sleep late , hate that ! My favoroite party is the bacon!! I l do eat and love breakfast! Bacon is the best part! I love the flavour. My favorite part is that someone else actually likes peanut butter and bacon! hehe I’ve been loving it since I was a kid…This is a much better recipe though…french toast yum…. i love the peanut butter filling! and yes, i love breakfast! I like that it has Pork smoked Bacon and I usually eat a light breakfast. This sweet and salty combination has me yearning to try it soon. Pork smoked Bacon, cooked and used in the recipe!! Oh YUMMO!! My favorite part is the bacon, because simply I love bacon. Thanks for the chance!! I always eat breakfast. THe bacon is definitely my favourite ingredient, but the peanut butter is an interesting addition. I love the combination of Peanut Butter and Bacon!! Oh this sounds yummmmmmmmy. Might have to make it when the lady times approach. Peanut butter! We love it here. I think I’d love the peanut butter/bacon combo. A person can’t go wrong with bacon. On the weekend, because time allows, we enjoy a sit-down breakfast, On work days I just grab a bar or a bowl of oatmeal at work. Well of course the bacon…but I’m also a huge pb fan! My favourite part is that it is stuffed. I eat breakfast everyday. these look so yummy! My boyfriend would love it! I am all about the bacon, but cant stand peanut butter! What can I substitute it with? I eat breakfast during weekends when I have more time. Eggs and bacon.on weekends. If warranted and I have time a smoothie will do me in morning. I am sure any nut/seed butter would make a good substitution if you are ok with those. I eat breakfast everyday and my favorite part is the peanut butter! But you had me at bacon!! i love that this doesn’t seem overly sweet. My kids would LOVE this! The bacon for me…Love it with the maple syrup. I don’t eat breakfast but occasionally I do go out for brunch. Bacon is my favourite part I have never paired it with french toast before. Can’t wait to try it. I try very hard to eat breakfast but often run out of time on weekdays. My favourite part is the peanut butter! I love breakfasts, and could easily eat breakfast for lunch or supper most days of the week! Cooing the bacon to my preferred level of doneness is the best part. I always eat breakfast every day. I love that it is stuffed. Yes I eat breakfast. My favorite part is the peanut butter! I try eating breakfast, I just don’t always have time. I love the bacon! I’m truly not a breakfast fan but if I saw bacon there, right in front of me my weakness for bacon would kick in and I would eat it, all of it! Love breakfast, can’t start the day without it! I usually leave French Toast and other fancier meals to the weekends though. Your bacon looks 100% perfectly crispy & delicious! Thanks for the chance to win.